Researchers have finally worked out where the noise that makes kettles whistle actually comes from a problem which has puzzled scientists for more than 100 years. It may come as a surprise to some, but in all the years that people have been brewing tea, no-one has ever quite been able to work out why kettles whistle. In a basic sense, of course, the reasons are pretty clear, but the physical source of the noise and the specific reason for the whistling sound have both remained elusive. Elusive, that is, until now. Writing in the October issue of the academic journal, The Physics Of Fluids, two Cambridge University researchers claim to have solved the conundrum, and in the process developed the first accurate model for the whistling mechanism inside a classic stove kettle. Perhaps reassuringly for those who never felt that this was a significant problem, the ramifications reach far beyond kettles themselves. Using the knowledge gained from the study, researchers could potentially isolate and stop similar, but far more irritating whistles - such as the noise made when air gets into household plumbing, or damaged car exhausts. "The effect we have identified can actually happen in all sorts of situations - anything where the structure containing a flow of air is similar to that of a kettle whistle," Ross Henrywood, from the University of Cambridge Department of Engineering, and the study's lead author, explained. "Pipes inside a building are one classic example and similar effects are seen inside damaged vehicle exhaust systems. Once we know where the whistle is coming from, and what's making it happen, we can potentially get rid of it." Henrywood carried out the research for his fourth-year project as part of his engineering degree, under the guidance of his supervisor, Dr Anurag Agarwal, a lecturer in aeroacoustics. Drawing on previous research by Agarwal, which identified the source of noise in jet engines, the pair were able to show how sound is created inside a kettle as the "flow" of steam comes up the spout. Having identified the source of the sound itself, they were then able to pinpoint two separate mechanisms, which not only create the sound but specifically cause a kettle to whistle, rather than making the rushing noise a flow might create in other household items, such as a hairdryer. A basic kettle whistle consists of two plates, positioned close together, forming a cavity. Both plates have a hole in the middle, which allows steam to pass through. Although the sound of a kettle is understood to be caused by vibrations made by the build-up of steam trying to escape, scientists have been trying for decades to understand what it is about this process that makes sound. As far back as the 19th century, John William Strutt, 3rd Baron Rayleigh and author of the foundational text, The Theory Of Sound, was trying to explain it. In the end, he posited an explanation that Henrywood and Agarwal have proven to be flawed. And Lord Rayleigh was forced to concede that "much remains obscure as regards the manner in which the vibrations are excited." Henrywood and Agarwal started by making a series of slightly simplified kettle whistles, then tested these in a rig, in which air was forced through them at various speeds and the sound they produced was recorded. This enabled them to plot the frequency and amplitude of the sound, and the data was then subjected to a non-dimensional analysis, effectively a set of calculations using numbers without any units, which allowed them to identify trends in the data. Finally, they used a two-microphone technique to determine frequency inside the spout. Their results showed that, above a particular flow speed, the sound itself is produced by small vortices – regions of swirling flow – which at certain frequencies can produce noise. As steam comes up the kettle's spout, it meets a hole at the start of the whistle, which is much narrower than the spout itself. This contracts the flow of steam as it enters the whistle and creates a jet of steam passing through it. The steam jet is naturally unstable, like the jet of water from a garden hose that starts to break into droplets after it has travelled a certain distance. As a result, by the time it reaches the end of the whistle, the jet of steam is no longer a pure column, but slightly disturbed. 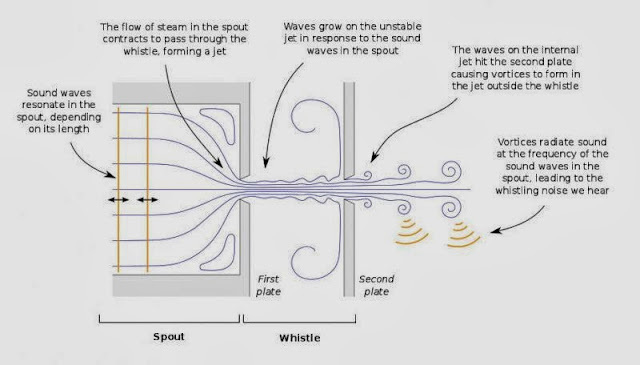 These instabilities cannot escape perfectly from the whistle and as they hit the second whistle wall, they form a small pressure pulse. This pulse causes the steam to form vortices as it exits the whistle. These vortices produce sound waves, creating the comforting noise that heralds a forthcoming cup of tea. Henrywood and Agarwal also explain why this effect makes a whistle, rather than another noise, by showing that the mechanism is similar to that seen in an organ pipe or flute. A specific frequency dominates among the sound waves because the note is determined by the size and shape of the opening, and the length of the spout. The longer the spout, the lower the note will be. The researchers also found, however, that kettles will whistle below the flow-rate at which the vortices emerge. Just as the water begins to boil, they found an entirely different mechanism, which also makes a sound. The difference was that the tone at this stage was fixed at one frequency. "The fixed frequency was intriguing and not something that we had expected to see," Henrywood said. "We eventually established that below a particular flow rate the whistle behaved like a Helmholtz resonator – the same mechanism which gives you a tone when you blow over an empty bottle." When air is blown over the open neck of a bottle, the Helmholtz resonator mechanism causes sound to radiate from the neck. The air just inside the neck is bouncing up and down – the air in the main body of the bottle being compressed and released each time like a spring. For the kettle, the spring is the air inside the whistle, while the air within the whistle opening reverberates like the air in the neck of a bottle. "In a kettle, of course, the air is blown through, rather than over, the neck – the effect is similar to whistling by mouth," Henrywood added. "In some kettles, both these mechanisms are happening. Because our study enables us to assess the mechanisms in action, we can potentially make modifications to stop the noise – if we want to." Henrywood and Agarwal are now working on a project to make quieter high-speed hand-dryers, by looking at how the jet of air released by these devices creates noise. Their paper on kettles - The Aeroacoustics Of A Steam Kettle – can be found in the October issue of The Physics Of Fluids.